Good morning everyone, hope you're having a wonderful day. Let's get right to it! I used the Designer’s Calendar and the Love Struck Cartridges. I cut the title at 1.5” and the heart was at 3.5…not absolutely sure about that size though. I glittered the heart and the title with some Stickles and inked around the patterned paper and the calendar. Pretty simple, but it is very pretty in person. Here is the “My Version” with today’s free files. I created the photo corners, the February title. I did also create the heart, but it isn’t one of the free files today….sorry. Here is another version using the same files. I just made the heart bigger and the photo corners bigger. If you are just now joining us for the calendar pages, here is the link for the ready to print pdf file for the 2011 monthly calendars. That’s it for today. So sorry for the short post. Have to go get ready for a class this evening :-) Don’t forget about the FABULOUS Blog Candy I am giving away this week. Have a wonderfully cricutliciously crafty day and I will be back tomorrow with some more great calendar pages and FREE Files! All three versions are gorgeous! Love the heart you created! Love the calendar page!! Now I need a new cart. LOL You do fabulous work. Another beautiful set. Just awesome. Thanks for the freebies. You Rock. Wonderful creations! Love these pages! I wasn't able to get on Sunday. Where can I get January calender. Is there a place that we can buy the day we miss. I love the calender page!!! love your calendar page. Can't wait to see the rest of the year. Thank you for being so willing to share your talent, your time and your creations with us. Super pages. Thanks for the freebies! These turned out wonderful! My favorite is #2. I love the paper that you used. Well I would love to give this calendar a try. What a lovely gift idea! Thank you very much. Love this! I can only hope to be lucky enough to win the subscription! Thank you for the calendar file. Your February calendar is beautiful. My goal this year is to make a calendar page for every month and your files will be a great help. Thank you for the chance to win the subscription. I have loved every day! Thank you so much! This will help a lot when I finish my calendar pages for our daughter. Beautiful page, Melin! I think the second one is my favorite!! Your projects thus far are fantastic. I only have design studio, wish I could get the other formats you offer. Thank you so much for your cute projects. Thank you so much for this post. 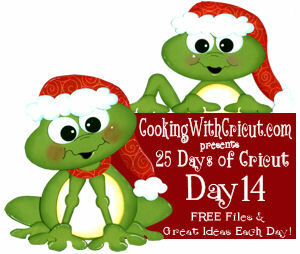 I want to let you know that I posted a link to your blog in Creative Busy Hands Cricut Freebies Search List, under the Elements post on Dec. 14, 2010. Thanks again. Melin, thanks for the chance to win a subscription to the bug magazine and thank you for your awesome files I've been collecting!! Love the calendar...great idea Melin. Great job with Feb. looks great! Love the calendar ideas! Hard to believe we are getting ready for a brand new year! Thank you for all the files you have shared. I am saving them for future use. And thanks for the chance to win a subscription. thanks for sharing some great files with! you do great work! Hate to think about starting a new year already! lovee your work. friended you on facebook..thanks for the files. Thank you so much for all your designs! The calendars will come in handy all through the year- I love using them for birthday cards! Beautiful February pages. Thanks for sharing the calendar!